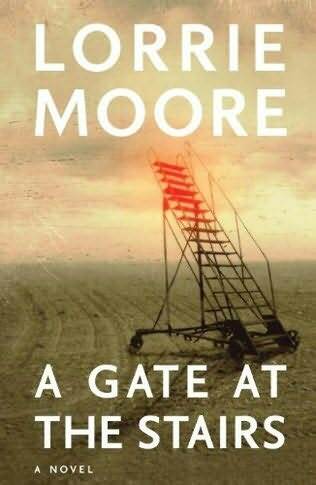 No one who is a fan of Lorrie Moore, or of coming-of-age novels rich in wit and specificity, should resist reading A Gate At The Stairs. It contains patented Moore delights: mordant humor in shades of gray to charcoal, a quirky, self-deprecating heroine who notices both too much and not enough about the people in her life, a bushel of laugh-out-loud depictions of contemporary American mores and fripperies, and finally, a double examination of the fragility of love’s intent. Tassie is the daughter of a Lutheran farmer of gourmet potatoes who sometimes affects deafness, and of a depressed half-blind flower grower whose Jewishness is kept ambiguous in the crucifix-dubbed Dellacrosse, Wisconsin. From this hybrid pairing in parochial soil, Tassie has emerged as a gifted, funny observer of life but an awkward and wry participant who communes alone with her bass guitar. She has ventured only 60 miles from home to attend college, yet she has no sustaining friendships. She fumbles the sweetness of her relationship with her brother while throwing herself at a dubiously exotic hookup interest. In spite of her peer awkwardness, she audits the grown-up world she encounters through her nanny job with the sophistication of a woman twice her age and five hundred times her mileage. As Tassie bonds with her astoundingly biddable charge, the serially-fostered and heartbreakingly affectionate Mary-Emma, she displays a savant-like ability to dissect the faux-fuzzy language of adoption, parse the unconscious racism of the “color-blind,” analyze the power dynamics of her employers’ marriage, and riff her way through all but the most devastating events with humor and detachment. Tassie also proves herself a lyric observer of nature, a gifted curator of closely confined groups of small children, and a ravenous consumer of experience and baby food. The precocity of Tassie’s articulateness is hard to believe, but also irresistible. Who would want to sacrifice such captivating narration for the sake of verisimilitude? It would mean missing Tassie looking out the window from her first plane ride and observing, “Beneath us was a tone of ochre that when the sun hit looked like a vellum lamp.” In an earlier passage she describes mosquitoes “with tiger-striped bodies and the feathery beards of an iris, their wings and legs the dun wisps of an unbarbered boy, their spindly legs the tendrils of an orchid, the blades of a gnome’s sleigh.” Sometimes her precocity is philosophical–“The difference between opera and life, I’d noticed, was that in life one person played all the parts,” and in the year covered by A Gate At The Stairs Tassie plays a lot of parts. Yet at the end of the novel, when Tassie makes acidic comments about marriage—“The gothic knell of a wedding bell, the hangman’s rope grown straight out of the chest”—the opinions sound ventriloquized and overly Plathian from a young woman who has never been married, and who has only observed two marriages up close. Moore is profligate with her famous sense of humor, bestowing it on Tassie and a majority of the characters in A Gate At The Stairs—almost everyone is attuned to language and absurdity, and apt to make above-average witty remarks at the drop of a quotation mark. That the humor all seems to carry the same DNA is a quibble, worth overlooking for the pleasure of laughing out loud. Although marketed as a “post-9/11” novel, global politics garner only a jokey gloss in A Gate At The Stairs’ opening section, and don’t “come home to roost” until the last 50 pages, embedded in a sudden plotline that blindsides the reader as much as Tassie. This 9/11 relevancy arrives after the novel’s central concerns—identity, attachment, race, motherhood, and commitment–get truncated and abandoned for over fifty pages. The lightning-like switch of topic reaches for a last-minute somberness which doesn’t feel entirely earned, and finally feels exploitative on the last pages when the novel closes with a phone call which is both inconsequential and sour, and whose bleak funniness would better suit a short story about feckless men than a novel about how our best intentions of love can still fall short. Michael Moore: ‘We the People’ to ‘King of the World’: You’re Fired! Posted in Book Reviews and tagged A Gate at the Stairs, Lorrie Moore, Novels. Bookmark the permalink. Trackbacks are closed, but you can post a comment. The books section of Identity Theory is maintained by Matthew Tiffany. Contact him to submit a review.